According to tradition, parsley should only be planted on one day: Good Friday. If planted on any other day, the planter would risk an almost certain dire end as parsley was once associated with death and the devil. The ancient Greeks feared the herb more than most and one day, in a particular battle, some clever Celt sent a donkey out adorned head to hoof with the green stuff and the Greek soldiers turned and fled! Fortunately, parsley’s bad reputation faded over the years and it has since been rightly prized for its flavour as well as its many health benefits. Recent studies show that parsley is one of the richest sources of a compound called apigenin, a cancer cell killing flavonoid that is found in many plants, of which dried parsley is the cream of the crop. Of course, parsley is also full of iron, vitamins K, A, C and B complex as well as what we are all lacking, magnesium. I try to use it as much as I can and my favourite way of using it is in stuffing. Everyone likes good stuffing. I’ve seen it on family state occasions such as Christmas and Easter when there is a large gathering and the vegans or vegetarians in the family find out that all the stuffing has dairy or sausage meat and there is none that’s suitable for them. There is nothing worse than violent vegans! I speak from experience. In Europe, lamb as the main feature for Easter dinner goes back earlier than Easter, to the first Passover of the Jewish tradition when the sacrificial lamb was eaten. As Hebrews converted to Christianity they brought these traditions with them and as the Christians often refer to Jesus as the ‘Lamb of God’, the traditions merged. In the United States however, ham is the traditional Easter staple. Traditionally meat was slaughtered in autumn, and the fresh pork that wasn’t consumed in the cold winter before lent was cured in spring. This type of curing used hard salt and took time and the first hams were ready just in time for Easter. The recipe below is for a simple sage and onion stuffing. It can be embellished with different herbs or vegetables depending on what you need it for. If stuffing a duck, you can add a diced fennel bulb or finely chopped sticks of celery. Rosemary or mint can be added instead of sage for lamb. For Easter Sunday we usually have a stuffed rack of Pork for dinner. We stuff it with this stuffing as well as dried apricots that we pre-soak in some good apple juice. It’s a colourful as well as very tasty combination. The recipe below makes enough stuffing for 1 large chicken or a 3lb rack of pork. You may want to make some extra as it will never be wasted. 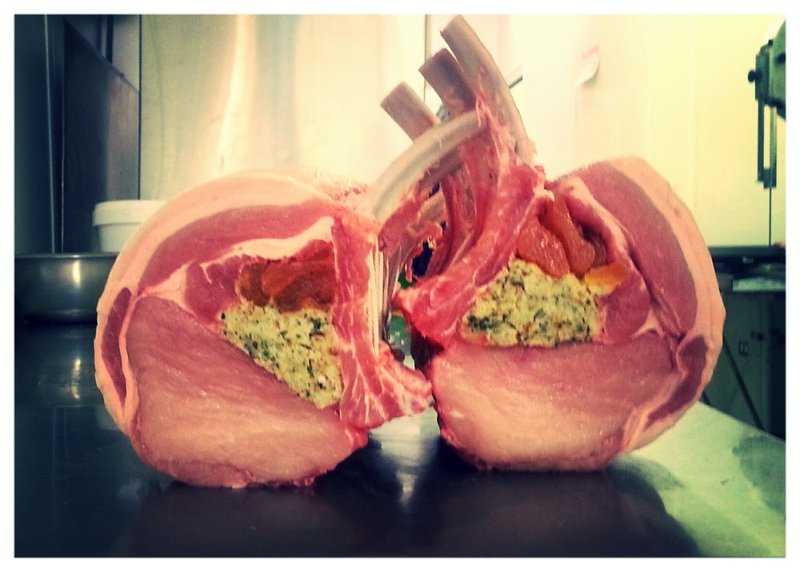 If you are not keen on tying your own joint, remember that you can bring your own stuffing into your butcher and they can stuff your joint for you. Leave out the butter in the following recipe if you have any vegans in the house! Melt the butter and oil in a heavy-bottomed saucepan. Add the onion and sage. Sauté gently until the onion is soft and translucent but not browned. Add the chopped parsley and take off the heat. Add the breadcrumb, season well and stir. Leave to cool. If using the dried apricots in the rack of pork, pre-soak in apple juice for at least 1 hour until plump. Add a row of apricots into the stuffing cavity and fill it with the cooled bread mixture. 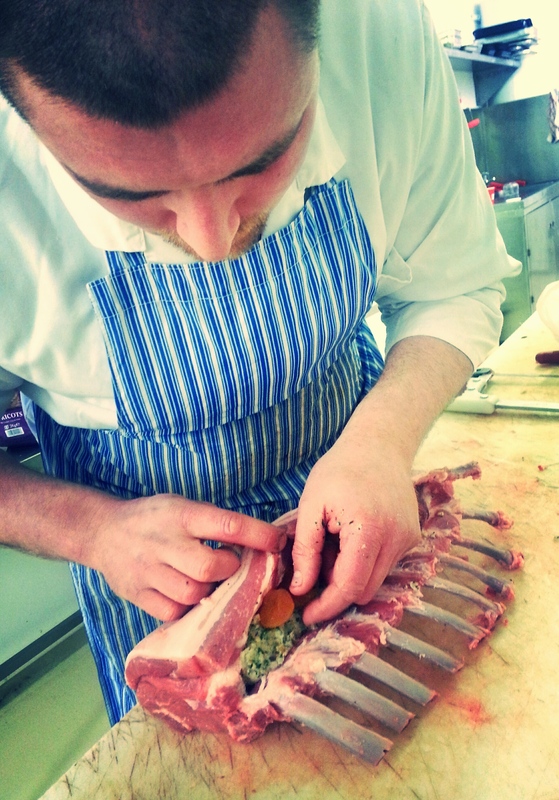 Tie the joint at intervals, or better still, get your butcher to do it for you!